We caught up with the mastermind behind Twitch Plays Pokemon to ask him about his social experiment. The Escapist: Thanks again for agreeing to do this interview. First up, how did you get the idea for the original Twitch Plays Pokemon? I understand that you picked Pokemon specifically because only games with a turn-based nature would be possible to use with the system, but what made you decide to run the "experiment" in the first place? TPP: I was inspired by SaltyBet, another stream on Twitch where players could bet fake money on the outcome of AI-played fighting game matches. I wanted to make my own automated stream and I decided on Pokemon because I perceived it as low hanging fruit, its gameplay was simple enough to where inputting buttons through chat could make for an engaging experience. I was considering many other games but they needed complex systems for interfacing with the game, I didn't want to waste time on something that might be fundamentally unappealing. The Escapist: Did you anticipate the level of popularity you received? I believe at peak, the stream was hovering around 40k players. How did you feel when the stream skyrocketed, and how did it affect your life? TPP: I was very stressed when it became super popular, I wasn't sure what the implications were going to be but after a few days I calmed down. My life already involved the administration of servers so having one extra service to maintain isn't that big of a change for me. The Escapist: I noticed that at first, you only had subscriptions, but now, the stream has advertisements. What made you decide to go down this route? How much money would you estimate to have made from the stream? TPP: No advertisements interrupting gameplay has been the rule I've always followed but there has always been pre-rolls (I have no way to disable those), Twitch wasn't made for 24/7 streams so there's always going to be those moments in between streaming sessions where when the stream starts back up a pre-roll will play, I usually try to do this manually and pause the game while it happens but sometimes connectivity issues force the stream to restart causing a pre-roll to appear during gameplay. I contractually can't reveal any information about the performance of the advertising, sorry. The Escapist: Lastly, what's next for Twitch Plays Pokemon? Popularity is certainly waning with the Crystal play through (at least compared to Red). Do you aim to continue on to Generation III, will you switch to a new game entirely, or perhaps something completely different? TPP: As I see it at the moment I'm going to continue with Pokemon Emerald after Crystal is finished. I'm planning on making a slight modification to the input system too. I'm giving consideration to more elaborate changes like using a randomizer or modifying the game to make it more punishing but I don't have anything planned. Be sure to tune in to the Twitch Plays Pokemon stream right here, and check out our weekly update to see what they've been up to. Peak was well over a hundred thousand viewers. It got up there about day five or six, when word got out and then again near 100k for the elite 4 in Red. My guess is that the use of players and not viewers, it was 40k people putting in inputs, not just people watching the stream. Anyway, I'll admit my interest in "Twitch Plays X" has waned a bit. I still check in every now and again, but I feel that it being Pokemon again caused a lot of other people to lose interest as well. I didn't know that anyone was keeping track of the number of people adding inputs. If the point is that everyone can play the game through twitch, I figure you can count each viewer as a player. 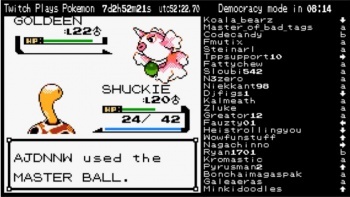 I stopped watching regularly during red when the democratic input method started being used, maybe following it up with pokemon again was not the best choice but it was super fun with pure anarchy the first time, even the simplest game can deliver when it's made supremely difficult due to the input method. The aggregate input method just turns a simple game slow and is what spoiled it for me. I dunno, TPP was such a funny and novel concept that you just had to check it out, when they finished, it was a total surprise. There have been some great jokes about Crystal, but even my interest wanes, I would say they should leave it for now and put it up later, when people are in the mood for more anarchic PokÃ©mon. I've lost a bit of interest but I still keep it on in the background to occasionally watch whenever I'm bored. While it doesn't have the helix fossil and all the stuff that came with it I'm still just interested to see how long it lasts. That being said as much as I'd love to watch Emerald I think he might want to think of another game to play, there's only so long everyone will want to play and watch pokemon. Oh god not emerald. In that game it is required to reach Rayquaza. The Twich stream as a 20 second latency and the tower you need to precisely use the mach bike. They will never do it. I'm pretty sure that's not actually required the first time you visit Sky Pillar. Only when you come back to catch Rayquaza after it's calmed Groudon and Kyogre down do you need the Mach Bike to get through. They might want to give catching Rayquaza a miss. As someone who's first Pokemon game was Ruby, I'm genuinely excited for Gen III. Whilst the previous two have been entertaining, there's something about the nostalgia that really helps to make it that much better. I would have loved to see an interview with the trainer. "So how were you feeling when you started this journey?" but when I do it's one by racecarlock. And now it's below 9k viewers. TPP is really running out of steam fast. The overuse of Democracy is making things boring and, besides catching a Goldeen with the Master Ball, almost nothing of interest has happened during Crystal. Yeah, people are losing interest, but I don't see why not continue it as long as some people still want it. There is still interest, at the moment there are 5000 viewers and they're just killing time before Emerald starts. That's not bad, it's only a small viewership when you compare it to the 100 000+ it used to be. I want to see it. I need to see it.